YuMi, the creation of ABB robotics of Switzerland, is the world's first bot conductor. The Maestro received thunderous applause and rave reviews when he conducted Italy's Lucca Philharmonic Orchestra and internationally acclaimed opera tenor Andrea Bocelli. 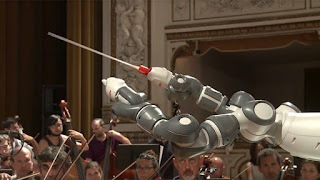 The robot, who can lead an orchestra playing Verdi, is one in a series of collaborative, industrial robots ABB is developing. ABB just introduced a new version of YuMi that can work side by side with humans on assembly lines. The robotic co-worker is part of the "Factory of the Future", working alongside humans doing the same tasks. Hence the term "collaborative" robots. The new YuMi has a single arm - not 2-armed like the Maestro. The company says it can easily integrate into any factory production. New YuMi is small, lightweight and agile. It's built on a flexible, new modular design platform that allows greater variety of robots, sizes and customized solutions. Incredibly it can also be mounted on the floor, ceiling, wall and tables to meet real-time factory needs. YuMi, the creative and collaborative Swiss/Swedish robot.